“MUPPETS MOST WANTED” (L-R) BRET MCKENZIE and JAMES BOBIN. Photo by: Patrick Wymore. ©2014 Disney Enterprises, Inc. All Rights Reserved. 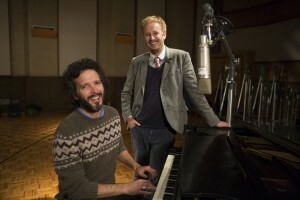 HOLLYWOOD—The entire Muppets gang returns to the big screen for “Muppets Most Wanted.” Returning along with them is Bret McKenzie, the original songwriter and music supervisor, who previously served in the same capacity with the 2011 box office hit “The Muppets,” which reintroduced the beloved puppet creatures to a whole new generation. McKenzie won the Oscar that year for best song with the power ballad sung by actor Jason Segel and muppet Walter (voiced by Peter Linz). In the highly anticipated sequel, McKenzie, best known as part of the comedy duo Flight of the Conchords with Jemaine Clement, has written six new songs for the international comedy caper, starring Ricky Gervais, Tina Fey, Ty Burrell and, of course, The Muppets. Among the new songs McKenzie wrote for the musical is the opening number called (aptly) “We’re Doing a Sequel,” which actually pokes fun at most Hollywood movie sequels. Additionally, he wrote a duet for Ricky Gervais and an evil Kermit doppelganger called Constantine (voiced by Matt Vogel) called “I’m Number One,” a Siberian gulag-inspired number for Tina Fey and Kermit (Whitmire, reprising his role) called “The Big House,” a power ballad between Miss Piggy (Eric Jacobson) and pop singer Celine Dion called “Something So Right,” and more. The New Zealand-born comedian/musician spoke about returning to create more catchy compositions for the Muppets, reteaming with director James Bobin (who helmed the 2011 movie) and his team and working out of an L.A. mini mall storefront to write his songs. Q: The song “We’re Doing a Sequel” ends with the Muppets singing the lyrics, “The Muppets Again.” Was that supposed to be the original title of the movie? When did it become “Muppets Most Wanted?” Also, did you think about putting in “Most Wanted” into the song after the title was changed? McKenzie: Yeah, the film was originally was called “The Muppets… Again!” So the first song ends with the Muppets all singing “It’s the Muppets again,” because we thought it be great for the song to have the title of the movie in it, but then, well after we’d filmed it, all (Disney) Marketing decided to change the name of the movie and, and so we tried changing the lyrics to, “It’s the Muppets Most Wanted,” and it really didn’t sit very well on the mouths of the Muppets, so we left it as it was. Q: There seems to be the influence of the old Hollywood musicals in this, reminiscent of the Busby Berkeley numbers. So how did you go about developing those aspects of the film? McKenzie: It was such a golden age for musicals as well. Those years are so influential on us now because what they did with the videos and the films for the musical numbers. I’m jealous of that time. It seemed like the actors spent most of their times doing dancing and singing lessons and then they come on set and know all their moves and they could all sing as well, (In a joking way) whereas now you’re dealing with actors who can’t dance or sing but think they can, but they’re great in other ways. McKenzie: Uh, yes, but what can you do? You know there’s a little bit of pressure. The Oscar sits on my piano at home, so, occasionally, I’ll be working on a song, and then I’ll look up at it and go, “Oh God, that’s not good enough.” But then, I moved to L.A. to work on the songs and we hired a space on Hollywood Boulevard—an old shop—and I put a piano in there. It was like this sort of dusty old shop to hide away and work on these songs and (director James Bobin and producer Todd Lieberman) came and visited, to listen to the demos and it was quite a funny scene because people would be walking by hearing me playing the piano and occasionally they’d walk in and say, “Are there music lessons going on here?” or “What is this? Is this some sort of art installation?” We liked to call (the shop) Muppet Solutions. Having worked on the first film, Kermit sent me a Kermit phone, which is a direct line to him. (He pulls a Kermit the Frog phone out of a shopping bag and places it on the table in front of him.) Once you’ve worked on the Muppets—we all have these. It’s like the Bat Phone. McKenzie: (deadpan) It’s a classic cold war comedy. Q: How closely did you work with director James Bobin on the songs? Have you ever delivered a song to James that he didn’t like? McKenzie: No. Well, occasionally. There’s a bit of back and forth so James and Nick (Stoller, the writer and co-executive producer) would come up with the idea usually or the moment in the film that needs a song and then they’d throw it to me. For example, the opening was, “We’re Doing a Sequel” was the idea and they had some good lines like … they often suggested lines that don’t rhyme which are not that helpful. (He laughs.) So then I’d just play around with it and I guess try to combine the idea for the song and also make it a song that works by itself, which is kind of a challenge. And then play it back for them on piano, with me doing my now quite extensive catalog of Muppet impressions. I can do Miss Piggy quite well. McKenzie: Come on, it’s Sunday morning! Okay, here we go. (In a dead on Miss Piggy voice) “How can something so right…” which is an absolutely ridiculous job. So that’s my weird career. Q: Some of your demos and outtakes are on the soundtrack, right? Q: Some of them you can’t even tell (the difference between you and the actor who sings it in the movie). McKenzie: (modestly) The Muppets could tell. They’re horrified. So (going back to how the songs come together), I will play a rough sort of version for James, and then we get together and work out the bits. James often has an idea that’s visual that he needs to change the lyric to suit the visual, and then we record it with the Muppets. So there’s lots of back and forth. I might suggest a visual idea. I love the ballad Piggy sings with Celine (Dion). I was working on that and I had this idea about what if we had this flashback of this dreamy moment where Piggy is sort of thinking about her future and she sees herself with Kermit growing old. She pulls out a little (baby). I thought it’d be fun to have a little pink frog and a little green pig. It was an idea that was around from the last film that I hadn’t got in and I was like “Ahh, it could be the ending”—that cool shot. I love those moments where the song idea and the video comes back because I’m not on set, so I don’t see them (shooting the film), yet James manages to lift the song higher with the visuals on screen. So it’s great. Q: What song from “Muppets Most Wanted” would you want to see submitted for Oscar contention next year? McKenzie: (He laughs.) It’s too early to talk about Oscars. Q: Do you have a favorite song from this? McKenzie: I think my favorites are the ballad with Piggy and Celine. Celine’s really great. I really like the way the opening song (“We’re Doing a Sequel”) works in the film. It kicks off the whole film with great energy. Who knows if they’re actually award-worthy? We’ll see.